Cloudy skies early, followed by partial clearing. High 53F. Winds W at 10 to 20 mph.. Partly cloudy skies. Low 38F. Winds WNW at 5 to 10 mph. Courtesy photo Artist David Arsenault is drawn to subject matters for his paintings that focus on light and geometric forms. The Saturday opening of his ‘In the Mood’ show at Spring Street Gallery in Saratoga Springs is a benefit for the Joan Nicole Prince Home in Scotia. Artist David Arsenault paints for peace. His oil-on-canvas paintings and giclee prints, which often feature iconic architecture from the Capital District, are meant to be a respite from the chaos of modern life. “I feel like if I can get people to stop long enough to experience a piece of peace, it can take them away from all the things that are stirring them up. My goal is to try to extend some of the peace I feel on a daily basis to others,” Arsenault said. The Niskayuna artist will show his work this summer in an exhibit titled “In the Mood” at Spring Street Gallery in Saratoga Springs. On Saturday, Arsenault will hold an opening for the show to benefit the Joan Nicole Prince Home, a Scotia residence dedicated to providing a safe, comfortable and caring place for terminally ill patients in need of a place to live during their finals days. Arsenault’s wife, Sue Koehler-Arsenault, is a hospice chaplain who works with some of the residents at the home. When the residence was closed last year because of funding, Arsenault wanted to help. “When we found out that the home was about to be closed because of lack of funds, David and I looked at each other and asked, ‘What can we do?’” Koehler-Arsenault said. The artist donated work for a benefit last August and helped raise $8,000 for the cause. The Joan Nicole Prince Home re-opened in June, and Arsenault is hopeful that the Spring Street Gallery event will raise awareness and money for the facility. As a painter, Arsenault said he is drawn to light. His subjects often emerge from quick visual images. “A lot of times they are things that have been caught in a fleeting glance. More often than not, it’s because of the way the light is hitting them,” he said. He also is intrigued by the forms of architecture. “I’m drawn a lot to things that allow me to play with geometry, especially triangular shapes,” he said. 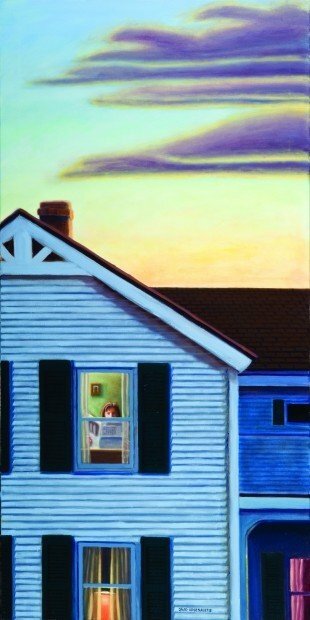 Although architecture is a common theme in Arsenault’s paintings, his body of work features a variety of subject matters, including images of Cape Cod. The same elements that draw him to a building inspire him in nature. “Many times it will be the play of light and dark on the dunes or the beach, water and sky,” he said. In a painting of the Malta Drive-In Theatre, the sign glows with a serene beauty against a haunting sky. The familiar image is realistic but also has an otherworldly feel. “I’m certainly not creating things that are surreal, but at the same time they are meant to capture the feelings I have about those experiences I am having when I see a place. Hopefully, I am capturing something that is new and fresh, as if it is being seen for the first time,” he said. The Jericho Drive-In in Glenmont, the L-Kens Drive-In in Colonie, the Tri-city Drive-In in Menands are among the local landmarks featured in Arsenault’s work. A former incarnation of the Community Court Motel in Saratoga Springs also inspired the artist. “I really like neon, and I particularly liked the way their neon was operating at that time,” he said. Some of the classic buildings Arsenault has portrayed are now just chapters in history. “So many of the things I have painted have since gone out of business or been destroyed,” he said. His work is like a memento.